Successful launch of the first Galileo satellite on December 28 marks the culmination of a process that began almost exactly 13 years earlier. On January 19 the European Space Agency and Galileo Industries GmbH, the European company steering a consortium of more than 100 subcontractors, signed a €950 million (US$1.15 billion) contract that will pave the way for the operational deployment of Galileo. The contract calls for a mini-constellation of four satellites backed by an extensive network of tracking and control stations that will validate the design of the Galileo space and ground infrastructure. Four satellites are the minimum required to generate three-dimensional positioning and precise timing over the selected showcase sites. In December 1992, however, Galileo was just a glimmer in a few visionaries’ eyes. That was the month that two European Commission (EC) directorates-general — those for transport and science, research, and development – decided to fund a modest study of satellite navigation options for Europe. The intervening years produced a kind of programmatic version of “The Perils of Pauline,” the cliffhanger serial movie in which each installment ends with the title character – a perpetual damsel in distress – placed in a situation that threatens her imminent demise, only to be rescued at the beginning of the next episode. Galileo’s most recent “peril” revolved around a dispute between Germany and other members of the European Union (EU) over the allocation of contracts and responsibilities that they would have during the deployment phase of the system. A December 5 agreement on sharing Galileo operational and control centers among five nations rescued Galileo from the months-long impasse. The next (but probably not final) act of the “Perils of Galileo” remains to be played out: the signing of an agreement with a consortium of companies that will complete the development of the space and ground segments and operate the system for the next 20 years. Current estimates place that milestone in the latter half of 2006, reflecting delays that have dogged the program since its inception and finally pushed its timeline for completion to 2010 – two years beyond the date long proposed by the EC and its Galileo partner, the European Space Agency (ESA). Nonetheless, the launch of GIOVE-A, the experimental Galileo spacecraft built by Surrey Satellite Technology Ltd., marks a major—and probably irrevocable—step forward for the European GNSS. The start of transmissions from GIOVE-A and a second testbed satellite, GIOVE-B, manufactured by Galileo Industries, will allow the system to lay claim to use of the radio frequencies allocated at World Radio Conferences in 2000 and reaffirmed in 2003. They will also allow ESA to evaluate on-orbit performance of several new satellite components and technologies and, significantly, also enable GNSS receiver developers to work with real signals in space. For example, GIOVE-B will be launched in the first half of 2006 and will have a passive hydrogen-maser clock as an additional payload, the first such clock ever flown into space. Current spaceborne clocks are cesium and rubidium frequency standards. Galileo satellites will also have rubidium clocks on board. Several aspects of the €3.8 billion (US$4.6 billion) Galileo program distinguish it from its U.S. and Russian counterparts, GPS and GLONASS: full civilian control, a so-called public-private partnership (PPP) in its deployment and operation, international participation, and a multitude of services, including some that will be fee-based with guaranteed delivery of service. Indeed, the political challenges have long eclipsed the technical ones. Until then the program had been known rather generically as GNSS 2, distinguishing it from GNSS 1, the European Geostationary Navigation Overlay Service (EGNOS), a satellite-based augmentation of GPS and GLONASS. In May 1999 the ESA Ministerial Council approved the GalileoSat program; in June 1999 the EU Transport Council endorsed a first resolution on Galileo. A November 22, 2000, EC communication to the European Parliament and European Council laid out the financing, organization, R&D, and implementation plan. In November 2001 the ESA Ministerial Council approved the development of Galileo (Phase-C/D, with a budget of €550 million). In May 2002 the Council authorized a joint undertaking, an institutional entity envisioned under Article 171 of the European Community Treaty but only implemented once previously, which allows the EU to collaborate in a single enterprise with non-EU bodies. ESA and the EC (on behalf of the EU) comprised the initial membership of the Galileo Joint Undertaking (GJU), which has as its primary task the completion of a concession contract. Subsequently, non-EU governmental organizations representing China and Israel signed on with the GJU. Other nations, including Ukraine and India, are expected to join soon. The concessionaire will complete deployment of the Galileo satellites and ground infrastructure and operate the system over the next 20 years, monitored by a Galileo Supervisory Authority. The overall cost of the Galileo system was first estimated at €3.4 billion, with a public investment for the development and validation phase of €1.1 billion divided between the EC and ESA. This phase was re-evaluated in 2005 at €1.5 billion. Currently, a “grand coalition” of leading European aerospace, telecommunications, and banking interests is negotiating with the GJU in a formerly competitive process that saw the merger of the two leading consortia in March 2005. Last month’s agreement on Galileo’s operational and administrative direction saw Eurely — a grouping led by Alcatel, Finmeccanica, and Vinci Networks — and the iNavSat consortium headed by the European Aeronautic Defense and Space Company (EADS), Thales, and Inmarsat, joined by a new consortium of Munich, Germany–based companies. The latter group, TeleOp, includes the commercial arm of the German Space Agency (DLR), the LfA Förderbank Bayern, and subsidiaries of EADS and T-Systems. But the agreement didn’t come easily. Multi-sided talks by representatives of eight companies and five governments (France, Germany, United Kingdom, Italy, and Spain) would reach tentative accords at one level or with one group of negotiators but then fall apart when brought to another forum. Coloring the dialog were national ambitions to be seen as leading the Galileo program and the sensitivity to geographic return — the practice of spreading contracts and revenues among program participants in a proportion close to the contributions made by the various nations. What they came out of the room with was a plan that reallocated key components of Galileo operations among the five leading space nations in Europe. The headquarters of the Galileo concessionaire will be located in Toulouse, France, with administrative and market development responsibilities. Inmarsat will have overall management leadership of the operations company based in the United Kingdom and responsible for global network operations, including performance monitoring and operations security. The two control centers (for constellation and mission) will be located in Germany (near Munich in Bavaria) and Italy (Fucino space center in Abruzzo region) along with two performance evaluation centers supporting the concessionaire headquarters. Spain will host backup control centers as well as facilities related to Galileo safety-critical applications. “It’s a major step toward a concession contract,” says Ripple. On the technical side of the program, Galileo has entered the in-orbit validation (IOV) and development phase using the two GIOVE experimental satellites to test out ESA’s spacecraft design and ground control. The IOV phase will conclude with the deployment of four operational satellites in 2008. According to the current schedule, an additional 26 satellites will then be launched over the following two years with full operational capability (FOC) declared in 2010. Galileo operational satellites will transmit signals in a variety of bands clustered around the 1176-1207 MHz spectrum near the GPS L2 frequency, 1775.42 MHz centered at the GPS L1 frequency, and 1278.75 MHz. The latter band lies at some distance from the GPS L2 signals at 1227.6 MHz, but would fall within one of the bands that Russia is considering for the third civil GLONASS signal that will begin broadcasting with launch of its new satellites in 2008. Galileo signal structures include a combination of biphase shift keying (BPSK) and binary offset carrier (BOC) designs. (Current GPS signals are BPSK variations, but future signals will also be BOC-based.) Recently, the Galileo Signal Task Force has proposed the addition of a composite binary coded symbols (CBCS) design that superposes BOC and a binary coded symbol waveform with the same chipping rate. 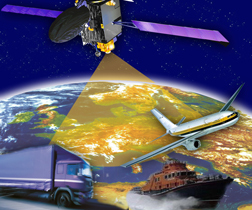 Galileo will offer five services: a free open service; a fee-based, encrypted commercial service offering higher accuracy and service guarantees; a safety of life service the includes signal authentication and integrity alerts (targeting, for example, commercial aviation); a search and rescue service operating in near-real time with a return communications link possible; and an encrypted governmental service known as the “public regulated service” or PRS, which will be used by public safety agencies and, conceivably, military forces. Certification for safety of life services is scheduled to occur within a year after FOC. This final point and the liability issues that it raises probably is the largest complication for the final negotiations in the concession contract. Sizing and sharing the risk associated with service guarantees introduces a problematical element to the Galileo project not faced by its GPS and GLONASS counterparts. As one participant in the deliberations has posed the dilemma: What do you do if a hiker in the Rocky Mountains gets lost and sues Galileo in front of a U.S. judge? Once signed, the concession agreement will lead to the phasing out of the GJU and the advent of the Galileo Supervisory Authority’s role. The concession contract also represents the turning point of the public-private partnership that marks Galileo as a different kind of beast from publicly funded GPS and GLONASS. The framework for negotiating the concession contract assumes a two-thirds contribution from the private sector for the €2.2 billion deployment phase and all of the €220 million annual expense of operating and maintaining Galileo. Given the past history of the European GNSS initiative persevering and escaping perils — including self-created ones, the Galileo project will probably manage to solve the PPP riddle and get on with the (comparatively) simple task of building and operating a system.